Firefighters from the Imboden Volunteer Fire Department braved cold temperatures and slick roadways to respond to an overturned semi in the curves just outside Annieville today. According to reports, the driver lost control while trying to negotiate the curves on ice covered Hwy 115. 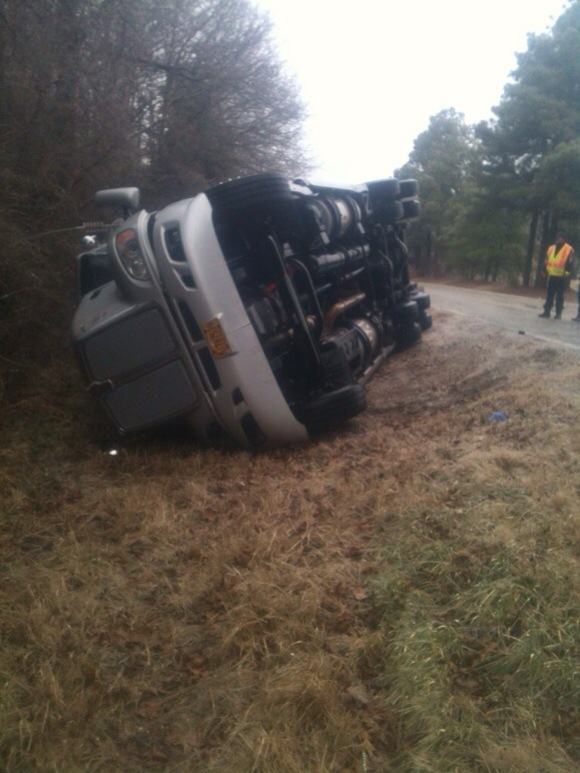 Lt. Gene Ponder stated the driver was not injured and the truck was carrying Hardwood Flooring. Dail’s Wrecker Service of Ravenden was called to the scene to remove the truck. 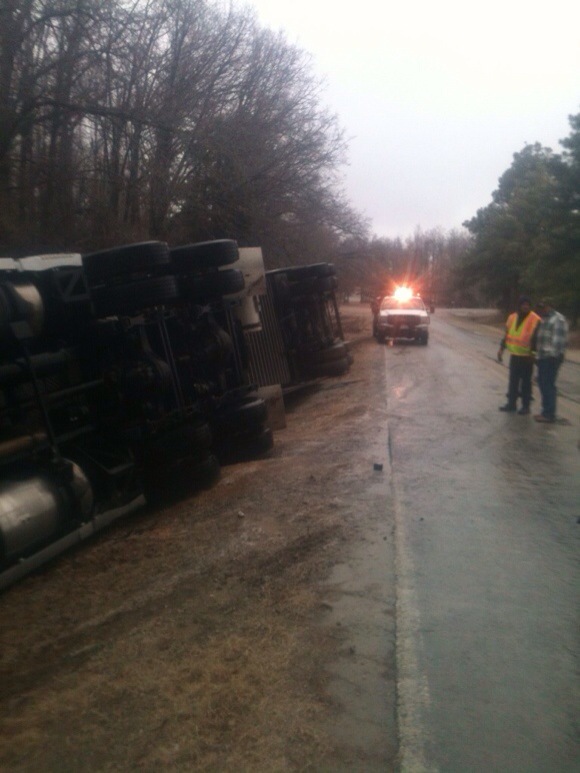 The accident was investigated by the Arkansas State Police. 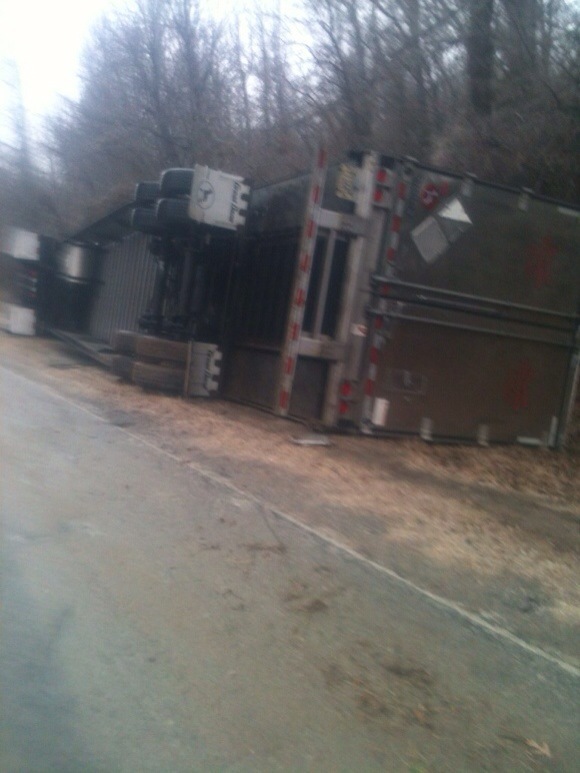 Elsewhere in the county, several accidents were reported including several in the Ravenden area along Lawrence 107. No serious injuries were reported in any of the accidents. Roadways around the county were ice covered for much of the day, Hwy 63 and 67 are mostly clear and passable but secondary road ways such as city streets and county roads are still covered and pose a hazard. Sheriff Dotson wanted to remind travelers that the roads are expected to refreeze tonight, travel with extreme caution especially on less traveled county roads. Temperatures are expected to be well above freezing on Friday helping the remaining sleet and ice to melt off secondary roads. For more information on the Imboden Volunteer Fire Department visit www.imbodenarkansas.com .